New advanced remote management software for ATVs ED2 Professional Series digital video recorders (DVRs). 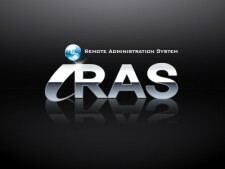 iRAS is a new advanced remote management software from ATV. It controls the ED2404, ED2808 and ED2916 system management, video monitoring, video recording and image playback of multiple remote sites. It is also backwards compatible with the legacy ATV DVR models, such as the VLDVR4, FA-HDX16, FA-HD916 and FA-HVR32, to name a few. To download a copy of iRAS Click Here.